All Kyani products are completely all-natural and safe to use, and is becoming more popular every day with more and more real testimonies rolling out. The Health Triangle is of the original Kyani Products- a powerful, easy to use wellness system that provides unmatched nutrition for optimal health. 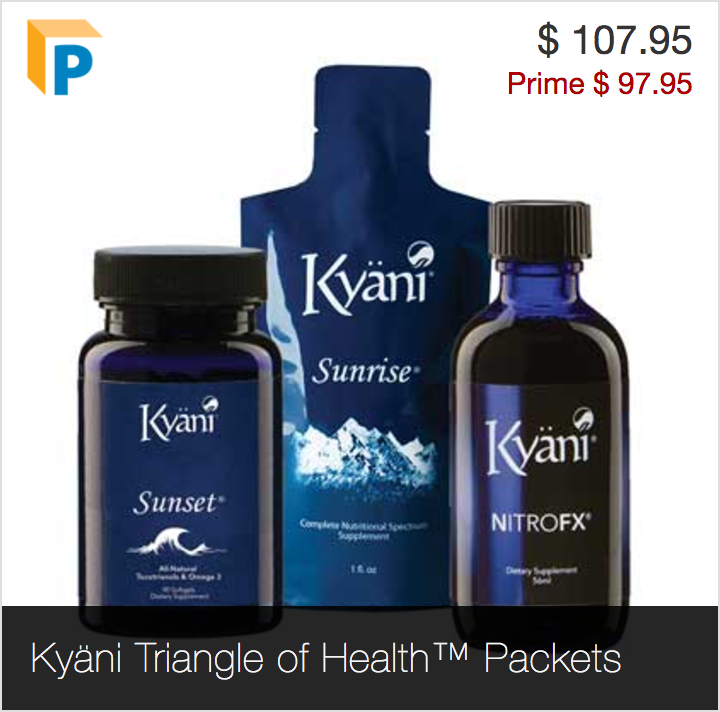 The Kyani Health Triangle features Kyani Sunrise, Kyani Sunset, Kyani NitroFX and Kyani NitroXtreme. 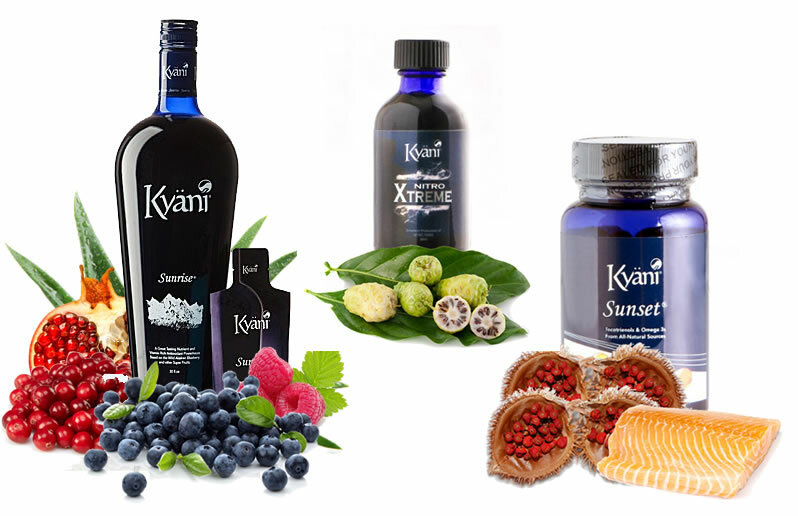 Each of Kyani products works harmoniously giving your entire body the ultimate HEALTH it requires for optimal nutrition. See more info below. Kyani's Health Triangle supplies the power of nature's Wild Alaskan Blueberries, tocotrienols - which is the most potent form of vitamin E, Omega-3 fatty acids, and Nitric Oxide in one very easy-to-use system. The latest of Kyani Products, Fleuresse. Our skin is always being exposed to environmental factors that cause damage (such as deterioration)... and as we get older our skin’s ability to improve and impair itself diminishes. Kyani has ascended its expertise in completely all-natural botanicals to harness extracts from a Swiss apple that opposed the ordinary spoiling process to stay nice and fresh. So by employing these extracts and other natural ingredients including Blueberry, Noni, and Tocotrienols, Kyani has developed this skin care system "Fleuresse". This is an exceptional line of skin care products that hydrates and cultivates your skin for a dazzling experience making you feel so much younger. You can shop and order the Triangle of Health system from our Triangle of Health page. 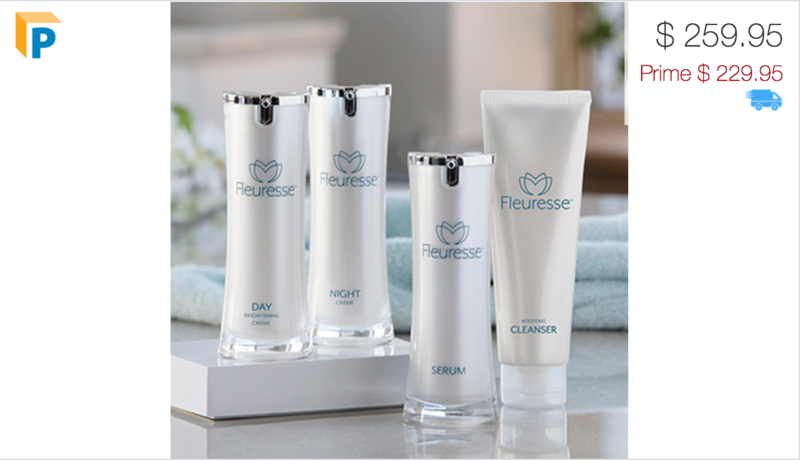 You can shop and order the Kyani Fleuresse system from our Fleuresse Kyani Skin Care page. If you've never taken any Kyani Products before, you are in for a real treat. Packed with an abundance of all-natural ingredients (both Triangle of Health products and Fleuresse Skin Care), there are absolutely no side affects and nothing but nutritional excellence for your health and wellbeing! Any questions, please feel free to Contact Us anytime. Enjoy!